Google Adwords is without a doubt a minefield, but you can learn so much by using the platform. 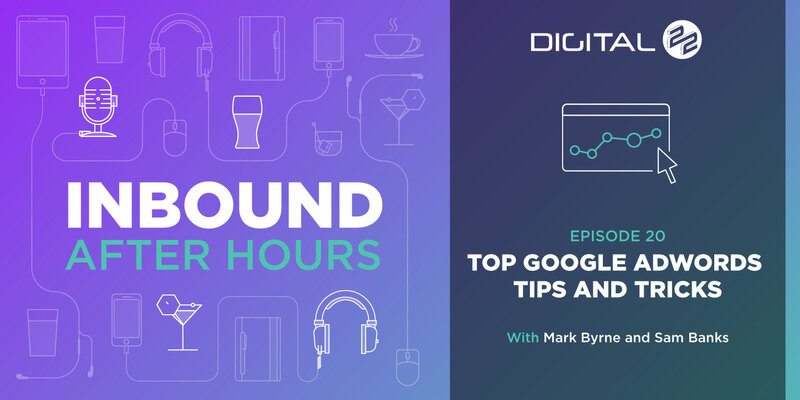 In this podcast we talk about Google Adwords -is it worth the spend? Does it still offer value to companies? Are you being left behind if you aren't moving to social ads like your competitors? We also talk through what people should avoid when setting up their AdWords accounts, where you can learn and how you can maximise conversions. Paid search is not dead. PPC Insight - How Much Does the AdWords Cost? Have some feedback you’d like to share. Do it in the comments below! - Hi guys! Welcome to Inbound After Hours. Today we have Sam on the show. Apologies for the jumpers, it is actually Christmas jumper day today in our office, so I definitely think Sam's won the competition there. - This is just my everyday outfit. - We're doing well today, how much have we raised Sam? - About 230 pounds. Weren't it for Save The Children, is it? - Yup, I think so. So that's a good shout, we're happy with that. Well done team, when you're watching this. Thanks for that and we'll get that handed over next week to the charity. Today we're going to be talking ad words. We're going to be talking paid search. - Sam is our expert, in-house expert. - Eh, let's roll with that, I'll roll with that. Let's go. - You're are Sam, you know you are. Can you give the viewers a little bit of background on yourself, what accounts you worked on, what sizes? - Yeah, absolutely. So, you can call me Sam. Obviously, I my full name is Samuel Banks. I started out with ad words about a year and a half ago. I started with absolutely no experience whatsoever. Came from absolutes, fresh faced kid out of college, first job, didn't know what to do, what I was doing. All of a sudden, boom, ad words. Countless accounts, I must have had 20 accounts at a time from like little small boutiques selling shoes to enterprises across the world selling work wear. It's mental. I've got quite a lot of experience, like around recruitment, we've got law agencies, we've got e-commerce. Really, really just a mixed bag, and it's been so valuable from being an agency and a personal opinion. And yeah, it's been fun. I mean, yeah. - I mean you've had some great mentors, obviously Rikki has mentored you, he's got 15 years experience in the e-commerce and paid search. So you've had the like of Ricky bring you through, and the reason we've got you on the show is that we want to prove to the viewers how much you can learn within a year, a year and a half. Can you give us an examples of the size of the accounts that you work on now? - Yeah, so when we saw it, obviously we had a couple of hundred pound budgets. People might have spend 50 pound a month, 100 pound a month. These are like one man bands trying to get the best out of their ad words. Like ad words, quick wins, straight to the top of the search engine, like woo sales. Rikki was great, I mean the absolute godfather of PPC at our agency. When I got it, we got a client out there that's got five accounts just for their one brand, throwing it in different countries in each, different languages, different customers, and best of all, just different keywords and ads, and it's just so great. We've still got the little ones, still got the wet ones that come in, doing all of the bespoke, little embroider logos on your woodwork, we'll do all this kind of stuff. But yeah, it's just a mixed bag. You get it all when it comes to ad words. You can't really say no. It's just always kind of fun to work on an account. - Okay now, good stuff. One question I've got is, we've obviously got question throughout the studio, should people be spending money on google ad words now? Because a lot of people are talking about paid social ads. Should people still be spending money on ad words, or? Is it worth the spend? - Well, I get asked this every day from clients, so when it comes for these guys as well, yeah. I mean, there's certainly still a lot of value in ad words. If you just shake your head and just shun ad words off, just from there, you are truly missing out, you don't know what you're missing out on. Social ads, they're based on the persona is all demographic targeting. What people don't realise is that you can do exactly what you do on social ads on Google ad words. And with Google ad words, because everybody thinks like, oh, social ads, that's the new thing, it's the in right now. So people, everybody's moved across there, but little do you know, if you just start on PPC, or you're currently on PPC looking to get the most from it. Your competitors are moving social channels, that doesn't mean you're being left behind. You should be capitalising on that. That means your search impression share is going up. Your costs are going down, and most of all, you're just going to be showing a whole lot more from keywords they can be converted on. So yeah, there's definitely still value in Google ad words. I definitely would not just shove it off. - Actually ten years ago, because I'm a lot older than you, and I remember ad words going for pence, and now they're going for pounds. The increase over the last ten years. And that's why we ask that question. It's gotten very expensive now. - Yeah, ten years ago I was barely starting high school. So just to make you feel old. - Yeah, I feel old. - Yeah, it's mad. Even in the last year and a half, when I've been working on accounts, you can see the genuine growth is CPC costs, look and see how many people are using ad words, you look at all these press releases and it just continues success with Google, continue success with Facebook. Paid isn't dead. Paid is really in right now. Just from a consumer and an advisors. There's more data than ever to target, and it's more measurable than ever. - And if you're not getting on Paid, there's always content locked in, there's email locked in, but to get the most out of all your marketing activities, you need to be implementing paid. - Especially this time of year, we're what? Five, six days from Christmas, then we've got New Year, then we've got January blues as you call them. - Oh definitely, it's horrible. - Seasonality, a lot of people stop this time of year, don't they? - It's just, it's really odd. I've managed clients in the past, and they really want to turn off their ads over Christmas, and it's mental. These guys are selling B to C. Like B to B, I could understand. But even still, people still work over Christmas, as I'm sure people are guilty of who watch this. If you're watching this over Christmas, no offence. But yeah, you should have a well thought discussion with your marketing team, or you should have a well look at your account with your agency, or just have a look at your account historically. Is Christmas, is January, is it a good time for you? Because generally what I've noticed, is actually interest picks up over Christmas rather than dies down. It's just, have you got the fail safes and practises in place to deal with that if you're not directly managing it over the holidays? - Okay. We've had a few pitfalls in the early days when we're learning how to set ad words account up. So just to give the viewers some tips so they can't make the same mistakes we did in the early days, what should they avoid when setting up an ad words account? - Okay, so one of the biggest faux pas when it comes to ad words is everybody put their key words into one campaign, into one ad view. No, that goes for social, that goes for ad words. It goes on both sides. What that basically means you're grouping all these key words while they may be really good key words for you, you're not getting the most from them because you're putting them all in a very unrelated group. And now if you're thinking if people are searching, perhaps on shoes. I've got a keyword that's shoes, I've got a key word that's trainers. Now, shoes could mean brogues. Trainers could mean trainers. If I've got them in one big key word mix, which is one ad group, and I'm just saying shoes for sale, top prices, top quality. Now the thing is, if I'm buying trainers, like I'm searching trainers and it's saying shoes, well I'm not looking for brogues, I'm going to click on someone else's ad. And the thing is with your impressions going up and no one's clicking it, Google's going whoa, you're not using our platform properly, if you want to carry on advertising, we're going to charge you an extra ten p for that key word. That's best click quality scoring in a nutshell. That's my biggest faux pas, and again, it's just people really should start when it comes to starting a PPC, is analysing what went wrong, or just reaching out. LinkedIn is great. There's so many groups out there, there's so many accounts. Just reach out and so many people are happy to help in the Google community. Like, what were your pitfalls, mine personally were putting all keywords into one account, but again, I was fresh for this, no experience. And, yeah, just have a PPC audit, have a checklist. There's plenty to download on the internet, trust me there. I've got them clogging up my hard drive as we speak. Just have a look and ask yourself questions. Like, what would you look for if you were to buy? What would you look for if you were looking for a new agency to take on if you were a B to B advertiser, and just keep your ads relevant. Don't make them intrusive. Make them convenient and helpful. - I agree with that. What about making, almost like pre-qualifying on the ads as well. You've just mentioned then shoes for sale. What about shoes for sale starting from 69.99, because you don't want everyone to be pressing your ad. The more you can qualify that person on the ads, it's going to save you money in the long run. You're almost telling the wrong people not to press the ad, but the right people you're inviting them in. - No, no, definitely. Google values that. Google values anything, that ad might be detracting business or whatever, but it's helpful and that's the bottom line. That goes into advanced targeting, especially if you're a B to B advertiser, that is a fundamental, it's an essential if anything. If I'm selling enterprise software to recruiters across the UK, across the world, I don't want to get a one man band who's to get on just a couple of hires for their new startup. I want to be getting the big boys. I want to be getting the people who are searching in work hours. I want to be segmenting that down as niche as possible. And even if that means I've got to pay five, six pound a click, if that click's qualified, I want them on my site. That's what you should be asking when you're doing a PPC. Like, the people who are clicking, do you want them on your site? And what are they doing on your site? Which is also a best practise when it comes to ad words. - That kind of leads into my next question then. So how do we maximise conversions within ad words? I know you answered that somewhat, if you can give us some more examples? - So one of the fundamentals of ad words, as we've been massively talking about, is ad words basically tells you how people are getting to your site. It gives you more context on that. What it doesn't tell you is what people are doing on your site. So first thing, when you're setting up an account, or taking on an account, or you're advertising with a new client, make sure they're link to analytics, because that click you can then track from store to finish what they did, what pages they viewed, and just everything. What they engaged with. And with that, you can then look at creating lists. If they viewed a certain page, if they viewed a certain product. If they filter into that list, you can re-upload that into ad words and target that list with a higher bid. That's advanced targeting. It's also segmenting your user's data. Another couple of best practises when it comes to getting the most out of your conversions, mapping out every conversion you've got on your site. If it's content, if it's a whitepaper, if it's a brochure, if it's a contact us form. If it's an actual purchase, if it's just to register your interest, make sure they are all ad words, and if you can, put a value against them so you can then track ROI. I see so many accounts in my MCC now a days where I want to put a value on them, but the client doesn't, because they have not lead scored each area of the website. - A brochure might be 20 pounds to you, cause they might have like a, you know, a one fifth of a chance of converting if they takes out a brochure download so that's a hundred pound purchase, it'd be a 20 pound, value in that lead. If you got that, you can track ROI and then you can really optimise your account. That's, it's just fundamental and yeah, just make sure your conversions are mapped and also make sure that your actual shopping cart funnel is mapped out on ad words, again very underutilised feature on ad words, see where people are dropping out and then like I've said before, just create a list for that, if people are dropping out on the registration fix the registration, re-upload that list, target them again with a bigger conversion and just make your ad copy specific like hey we still got them trainers, we'll hold them for seven days, make it dynamic so it counts down and people will click back on that and go, oh yeah, that was really helpful, I forgot about those trainers, click, click, boom, you've made a sale. And it's fantastic. There fundamentals for conversions. - Okay that makes sense Sam, so you've told us about optimising ad words, a lot of what we do in our business as well and we've done podcasts on is growth driven design and optimising actual websites, how important is this for Google ad words? - So one of the things people do is they create a website and then they leave the website. Now GDD is a complete new concept, as you should probably go and click that link, it's Neil Summerfield isn't it? - Luke Summerfield, so you should click that link with Luke Summerfield and have a watch of that before you even come on to what I'm about to say. A lot of people leave the website there and then. GDD continuous design but that should incorporate all aspects of your marketing, it's constantly building out and your ad words account should have the same principle. You take a couple of pages, you do a bit of ad words to them pages, if they work, take another couple of pages, build it out. And that's what you should do. Now if you've got a landing page that you need for like If you just created a new page on GDD, now what GDD doesn't do is that if you create a new page, you're gonna have to wait a while to get traffic on that and see how that performs in order to start building out your website. You know PPC fast tracks to that. If you wanna get the most conversions out of that sends some trapper to that page, see how they interact with it, make sure the keywords are relevant and you're just speeding up the process of you GDD and you can get that absolutely killer website in like half the time. Apologise about the jingle. - Yeah, I heard the jingle. - But yeah, no GDD and PPC goes hand in hand and when it comes to conversions, it can really speed up the process of your sites' performance and efficiency. It's just yeah, like traditional website design, you should always map, you should always mirror your ad words build with your GDD build. Make sure both of them are aligned and it's symmetrical as you build out one side of you GDD, build out side of you PPC. It speed it up, it's better, you convert more, it's just a win win. - It's just crazy how new clients who come on board with us are pumping thousands of pounds sometimes daily or weekly and they haven't changed the site in three years. - It's, I mean the argument is if somethings not broke don't fix it, the funny thing is, these are very broke. That's why they come on so when we build, when they build them out they should, you should pause your spend. Now the thing is with ad words, people get used to your ads, especially if you leave them the same and people get sick of your ads. Your ads should be fresh and you website should reflect that, if you've not got a poor performing page, you should be putting traffic to it, you should be, you're directing, you put a diversion, so your traffic goes somewhere else from page or yeah, just cut it off, cut them kind of keywords off and it's just mental. I mean I've seen clients who have come with thousands, thousands into ad words like but they've got no conversions in that with their site, their site doesn't have any conversion value on it. And it's to get their answer, so it might be like if I'm looking for, if I'm searching a question like what is inbound marketing? I might answer that on a website about a general marketing forum and I haven't got an ebook on there I haven't got a contact form, I haven't got speak to a professional, get more value, it's just inbound marketing is. And outwards form of marketing or and inbound form of marketing, whatever it such is. That's what it, like that is it, like people will see in and then they'll bounce and then that's it and then when it comes to the client will go, yeah, I've been doing PPC for a couple of two years, now anybody that's taking on that account will go oh yeah brilliant, we're taking on a new account and then when you look into it, it's like well what worked and they're like I don't know, I just did ad words for two years. - Yeah but I mean, that's a good shout so for the people out there who are trying it themselves, these are all great tips, what about the marketing professionals out there who are paying agencies to do it? - How do they know they're getting the best results from their agency? - So like the whole idea that your ad words account should be scalable, mirrored, transparent, that's what you should be looking for in your agency, now that's just fundamental when it comes to looking for an agency, you should be having weekly calls to your agency and just making sure they're explaining what they want to do, what they're actually doing and why they're doing it. If they can't answer them three fundamental questions, they're not optimising your account, they're just adding to your account. It doesn't mean it's gonna work and more so what the person, your agency, the freelancer, whoever you've hired to manage you PPC, they should be asking questions, like they should be asking questions like, they should be pointing out, if you don't have any conversion values on your page, instead of them putting keywords, they should go like, no we're not doing any more ad words to this page until you put a contact form on there. They should be making, they should be limiting you PPC spend if anything, to improve it. If people will just go, yeah, we'll do that, yeah, we'll do that, yeah, we'll do that, I'd be a bit worried. Especially if they're doing all this stuff, are they gonna report on all this stuff and more so, the best thing about ad words, the best thing about PPCC in general, with how measurable it is, you can also go in there yourself, check the change log and see when people are doing changes to your account. Now a lot of people don't do that so if you've got an ad words account and you haven't heard back from your agency, have a look in there. - Yeah, fantastic tip that, so that's really easy to do, go in there, see the history, see when your agency last touched in, logged into that software and did anything. I love the tip about making sure they're not just adding but optimising. - Yeah, make sure they're asking questions, make sure that actual, they're removing stuff as much as they're adding stuff. If they're just adding a lot of stuff, I'd be worried, I'd be worried. No account is perfect, I can admit that, managing accounts, there's always scope for improvement so there should be stuff being paused as well as stuff being added. - Yeah and make sure the agency is constantly asking you questions yeah? - Yeah, no definitely, I mean for an agency to best understand what you need from you PPC they should be asking questions, what they can do for your website and what you can get the most out of your website to help them with your PPC to get you the bets results. It should be two way, it shouldn't just be them reporting back. - That's great Sam thank you. Some good tips there and question from me this one, Bing ads, people still spending on Bing ads, should we be spending money? - Well maybe ten years ago when you used it. No I'm joking, no Bing ads is still as alive as it ever could be. Now with Google ad words, like everybody thinks, like I said earlier in the podcast, everybody's moving to social then what happened to Bing, like does it still exist, you don't ever say like, oh yeah I'll just go on Bing, no one says that but the truth is like the people that don't realise because everyone uses Google, people still search on Bing, people still out there still has a windows phone and it goes through Bing, it doesn't go through Google. So when people are searching like, oh cheap shoes, that 2000 keyword has about 10, 20 advertisers maybe advertise on that. That might be a 20 p cost per click, it might be, even if it's a really long tail, niche keyword, pennies, absolute pennies when it's compared to ad words and you can get ten times as many clicks on Bing then what you get in ad words and the only real reason to get a definitive answer is is Bing dead, is if you try it yourself. And the best thing is, it's a lot cheaper to try than what ad words is, so if you're looking to start on PPC and you've got a really stricken budget and you wanna see if it's for you, try Bing first. You'll get a feel for your keywords, see what working and you'll get a really good learning curve at a lot cheaper cost than jumping into the deep end with ad words or just jumping into the river in general with social ads. - You're the man today Sam, lots of tips, lets finish up on some more, have you got any more inside tips, techniques or tricks we can finish off on before we go? - Yeah, so it's Christmas, time of gifting, gifting knowledge and stuff like that. But I'm not accountable for anything that happens. Yeah so when it comes to, this is also for social ads, when it comes to social ads, ad words, Bing the best thing you can do is everybody does it differently, you can measure it in so many different ways, you can custom it to how you wanna see, when you wanna see it, especially with the new ad words interface, we recently did a blog on that, we'll probably link that in the blog where we're putting this podcast. What you can do is you can customise all the columns you've got, now by default you'll have how many clicks, how many people saw it and how many people clicked for it. That's great to know but how many people converted from that campaign, how many people converted from them keywords. Now a big one, a big one that people don't use even from a start, even some agencies that don't seem to use it, is it's called search impression share and what that does is basically it highlights where there's opportunity to improve, like how much of the time you are showing for your bid compared to how much time you could be showing. So if you want, it'll tell you how much like, I might be showing 80 percent of the time but then 15 percent of the time I'm losing out on showing because my bidding's not high enough. These columns aren't in there by default, you add them in, you'll be able to see all that and then there's also other ones I mean if you've linked your Google analytics by best practise with ad words and Bing, you can put bands rate in there, so what happens is you can see you campaign like, not only that, you can do all your reporting from ad words it's so easy like what, when you're doing a monthly report for a client, when you're doing a monthly report for your superior, your boss, like it might take two hours before because you're going through analytics, you're going through ad words, what you can do is you can make ad words centralise all your reporting. Similar to HubSpot when it comes to inbound. So yeah, just make sure you've got bands for it cause it will tell you like your campaigns, you might have a 75 percent bands for it on that campaign. And you can go into that, which keywords dragging that up, which keywords dragging that down. Pause it, turn it off, put bids up, change your I copy, and it offers, the more clones you have that are relevant and you understand them, offers you a sense of direction with your account. And if you've got that, you'll always have scope to improve and in turn, you'll always be optimising your account. - Okay so we talked optimization probably three or four times in this podcast, how many times a week or a month are you checking in on clients' accounts and optimising these? - So back when I used to do it, I used to look in daily, we used to have daily checks I mean obviously we do it a bit differently, we price it and stuff like that but it's mostly dependent on how much you're spending, if you're spending a couple of grand a month, you should be in there at least four times a week. Bare minimum. If you're just spending a couple of hundred, you can probably get away, it depends on how much you're spending, what keywords your targeting, you might be, if you're targeting really competitive keywords, you budget may be used very very quickly, so you need to be in there and on it. By rule of thumb, when you start out you should be in there daily. Top tip never start a campaign on a Friday, because when you go off for your weekend, you'll forget about your ad words campaign, you'll come back on Monday and you've just wasted 200 quid and you don't know what happened. So yeah I'd say daily, make sure you don't, you're always looking at what you're doing, and start off slow, I can't express how much you just need to start off with a couple of keywords, if they do well, add a couple more. What so many people do is when they do checks is they go, oh right we've started PPC that's all the website keywords, there's a couple more that I wanna target, into ad words, into Bing, into social and what happens is they're all fighting for the same budget and you're not getting an accurate feel for what works so when you're doing your daily checks, make sure you're doing it slowly, build it out. So in the starting point you're doing your daily checks more, but as you're future proofing and making sure what works is working, and what working is off, you can start alleviating the frequency and it can, you can then be checking it once a week, especially when you start adding negative keywords and monitoring you search terms and you inquiries, I.e. what you're ads are showing up for. - Thank you Sam, great stuff. What I'd like to do is invite you back. I'm quite impressed today. I'll invite you back when Ricky, Andrew and Paul are back in the office and I'd like to talk about sort of paid social ads, I think that's worth another podcast, I know that's something you're heavily involved in. - Oh yeah definitely, lets jump on that bandwagon, and have social ads, I mean it's been dropped a couple of times on this podcast so it's a bit of a hint, bit of a trailer, if anything for that. - Yeah so we'll have you back and merry Christmas to you and everyone out there. - Yeah have a happy Christmas and a happy new year as well. - Okay and thanks a lot and links then we've got our highest sort of ranking blog at the minute is how much do as words cost? We're gonna put that in the show notes below. Our one on GDD and you mentioned another one earlier. - Yeah the new ad words interface, that's a really good guide on how to get started as well, with the massive change ad words rolled out. - Okay we'll put them in the show notes and thanks guys and merry Christmas, take care.